Merlot is a red-wine grape originating in Bordeaux, but now very widely grown (worldwide, it is the third-most-planted wine grape). It is generally considered one of the dozen and a half or so of world-class red-wine grapes (those in boldface in the dropdown varietals lists farther up the page). Merlot is one of the traditional grapes used in the red-wine blends that characterize Bordeaux (blends known to the British as "claret"). 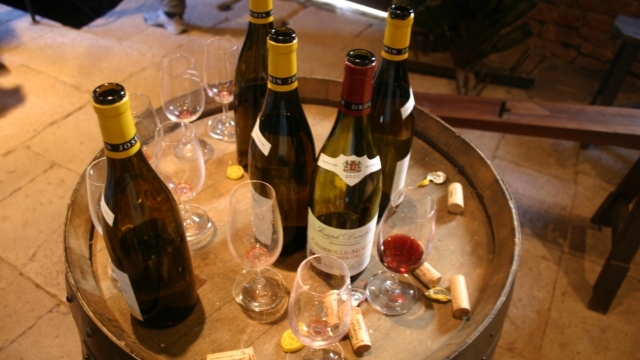 Americans are used to wines that are bottled and marketed by varietal name (which now requires that the wine must be at least 75% of the named type); but in most of Europe, the tradition has been to produce named blends, with laws specifying—usually quite tightly—what percentages of what grapes may be used. The principal Bordeaux grapes are Cabernet Sauvignon, Merlot, and Cabernet Franc, though there are others. Merlot wines are considered to be softer and "fleshier" than the "sterner" Cabernet Sauvignon, and thus act to moderate Bordeaux blends with body and softness. Merlot tends to be very much the dominant grape in so-called "Right Bank" Bordeaux reds (whereas Left Bank reds tend to be dominated by Cabernet Sauvignon). Merlot is now immensely popular worldwide, and scarcely any winemaking country does not have extensive Merlot plantings. That has inevitably resulted in large amounts of harmless but bland and undistinguished Merlots, which have in recent times given the type a somewhat diminished level of respect, even though some of the world's greatest wines (such as Château Pétrus) are almost wholly Merlot. Merlot is (like any grape, really, but especially like Zinfandel) capable of yielding hugely various wines, depending on the vintner's concept of what the type should be. But, broadly speaking, Merlots are relatively unaggresive, "rounded" (or even "fleshy") wines dominated by red-fruit aromas and tastes. Some winemakers, however, opt to make their Merlots emulate Cabernet Sauvignons, and those are rather higher in alcohol and tannin, with more intense flavors. Others feel that that is not true to the basic nature of the grape, and make more restrained wines from Merlot. "If ever there were a red answer to Chardonnay, Merlot is it." The general sense in the business seems to be that in the New World, Washington State is the clear winner on Merlot, with California still struggling to emerge from the bad old days, but with Chile (and sometimes Argentina) producing some pretty good value wines. In the Old World, quality is there, but pricing on what is available in America is high, saving the Cru Bourgeois wines of the Right Bank. Factoid: It is now thought that Merlot is a cross between Cabernet Franc and the obscure grape Magdeleine Noire des Charentes. It is related to Cabernet Franc and Carmenere. "Merlot can make soft, velvety wines with plum flavors. While Merlot wines tend to mature faster than Cabernet Sauvignon, some examples can continue to develop in the bottle for decades. There are three main styles of Merlot — a soft, fruity, smooth wine with very little tannins, a fruity wine with more tannic structure and, finally, a brawny, highly tannic style made in the profile of Cabernet Sauvignon. Some of the fruit notes commonly associated with Merlot include cassis, black and red cherries, blackberry, blueberry, boysenberry, mulberry, ollalieberry and plum. Vegetable and earthy notes include black and green olives, cola nut, bell pepper, fennel, humus, leather, mushrooms, rhubarb and tobacco. Floral and herbal notes commonly associated with Merlot include green and black tea, eucalyptus, laurel, mint, oregano, pine, rosemary, sage, sarsaparilla and thyme. When Merlot has spent significant time in oak, the wine may show notes of caramel, chocolate, coconut, coffee bean, dill weed, mocha, molasses, smoke, vanilla and walnut." 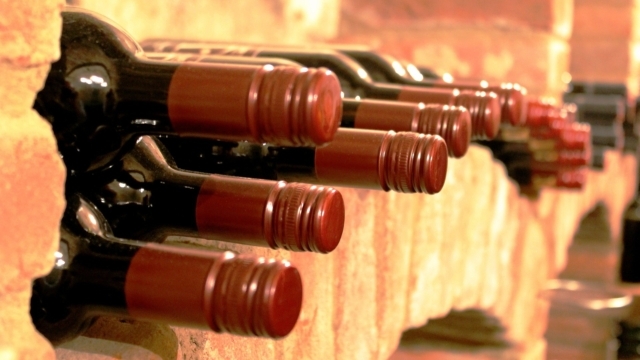 "The precise flavors that Merlot imparts to a wine are not easily grouped. 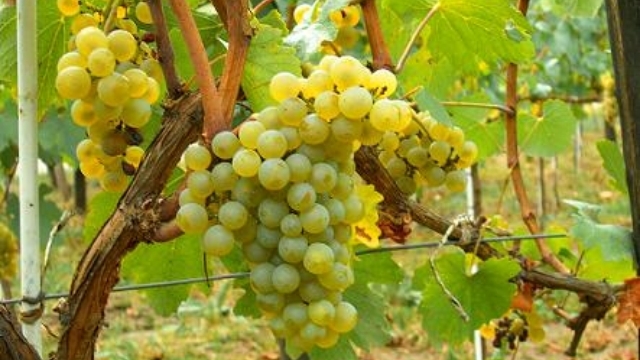 It is a grape used for producing wines of a particular texture, rather than a particular taste, relying on organoleptic properties other than just flavor and aroma. Smooth, rounded and 'easy-drinking' are common descriptions of Merlot wines. The main reason for this is that Merlot grapes are relatively large in relation to their pips and the thickness of the skins, in which tannins are found. For this reason, the variety is used to soften wines made from more tannic varieties like Cabernet Sauvignon (in the Medoc) or Malbec (in Cahors). It is also used in cooler vintages to balance the austerity of under-ripe grapes and to make the wines more approachable at an earlier age." "Flavor Profile: Medium to full-bodied wines with flavors of black cherry, plum, and tobacco. . . . Merlot enjoyed a surge in popularity in the 1990s as consumers suddenly discovered that they could enjoy aromas and flavors similar to those of Cabernet in a fleshier, softer wine with smoother tannins. A wave of Merlot plantings followed, frequently in soils and microclimates completely inappropriate for this variety, and the market was soon flooded with dilute bottles from young vines and high crop levels, and weedy, herbaceous examples from underripe fruit. Many of these undernourished wines were overoaked in attempts to mask their deficiencies. . . . Expect [nowadays] to find broad, supple wines with medium to full body, typically with aromas and flavors of black cherry, plum, dark berries, dark chocolate, tobacco, and earth, and suave, fine-grained tannins." "Merlot wine is regarded as the underdog to Cabernet Sauvignon. How come? Because cheap commercial Merlot has given the varietal a bad reputation. . . Fruit: Black Cherry, Raspberry, Plum; Other: Graphite, Cedar, Tobacco, Vanilla, Clove, Mocha; Oak? Yes. Usually medium oak aging (8-12 months); Tannin: Medium; Acidity: Medium; ABV: 12-15%"
"Merlot’s popularity is due to the fact that it is softer, fruitier, and earlier-maturing than cabernet sauvignon, yet displays many of the same aromas and flavors – black cherry, currant, cedar, and green olive – along with mint, tobacco and tea-leaf tones. Although enjoyable as a varietal wine, it is probably most successful when blended with cabernet sauvignon, which contributes the structure, depth of flavor, and ageability merlot lacks." "In character, Merlot offers flavors of chocolate, plums, licorice, black cherries, blueberries, black raspberries and blackberries as well as jam, which depends on the levels of ripeness the fruit was allowed to achieve. It is round, fleshy and can be opulent in texture. Florence Decoster of Fleur Cardinale in St. Emilion adds to our description of Merlot: 'Merlot is a grape variety that gives round and delicious wines, with aromas of black fruits such as black cherry, blackberry and cassis. You also get aromas of truffle, violet, plum, chocolate. For Merlot, our aim is to maintain the freshness of the fruit, before it becomes too soft and loses its freshness.'" "Merlot plays the luscious role in the blended wines of Bordeaux, adding forward plummy, fruity richness to more austere qualities of Cabernet Sauvignon. More supple, with higher alcohol and softer tannin, Merlot is often more approachable in youth than Cabernet Sauvignon. It adds richness to the hard edges – putting meat on the bony structure of Cabernet. Petrus’s reputation on the auction block, notwithstanding, it is Cabernet Sauvignon that gets more attention from the rest of the world. Even though Merlot has a voluptuous character, because of its willingness to yield generously, it is vulnerable to being turned into rather dilute and characterless wines." Obviously, with a wine type this popular, the possibilities are myriad. We have tried to present a reasonable palette of sources and styles, each representative being one well and widely praised. As with any major wine type (Cab Sauvignon, Chardonnay, and the rest of the usual suspects), one is hard pressed to find Old World specimens of high quality within the under-$20 range, and in fact we show only one (and that from Italy, not France); real values will typically come from the New World. But "New World" is itself quite a various category, from the U.S. to South America and beyond. ♦ Plum, blackberry and boysenberry aromas show nuances of citrus peel and rubber band. On the palate, this is tight, mildly tannic and slightly astringent due to firm tannins. A mix of ripe blackberry and cassis flavors come with chocolaty oak in front of a hard-pushing, lightly herbal finish. 92 points. ♦ This is a delicious wine styled to be both plush and pretty. First is the rich ruby color with glass-staining extraction. Then the aromas of red berries and tarragon traced by a whiff of black pepper. The fruit keeps up the action on the palate, with plum and raspberry the most predominate flavors. A savory note of wet clay and rusted farm equipment keeps the wine from going simple. An element of lemon oil and spice moves into the finish. The fruit keeps on coming. ♦ Lapostolle Cuvée Alexandre Merlot has an intense ruby ​​color with touches of purple and red fruit with an intensity, elegance and complexity intertwined with spicy and cocoa aromas. ♦ The crunchy red fruit comes first, but there’s enough tannin power in this merlot to make it more than just refreshing. There’s structure for a steak, and enough acidity to cut the fat from anything off the grill. 90 points. ♦ This opaque and dark ruby colored Merlot from Chile opens with a lead pencil and old leather bouquet with a hint of black cherry-cola. On the palate, this wine is medium bodied, balanced, and juicy. The flavor profile is a mineral infused plum with hints mild black raspberry. The finish is dry and its mild tannins are subtle. ♦ Dark ruby color with slight translucence; blackberry, plum, cherry on the nose; dark cherry, blackberry, plum, strawberry, red and purple fruits, even walnut on the palate. Medium body, easy drinker; silky tannins that continue to show on the long finish and flash some grip in first glass; benefits from air time in large glass or decanter, opening to reveal more depth of fruits and less insistent tannin. Reserved acidity, balanced; some complexity for this price point. Oak and mocha from six months in small French barrels, but by no means offensive (much less than Falesco’s top-shelf merlot, Montiano Lazio). This is not a smooth, insipid merlot with scant character; you get serious Italian red wine attitude, something you expect from Falesco. ♦ [V]elvety and sumptuous, it retails for less than $15 in the US. From vineyards in Montecchio, in the heart of Umbria, the Merlot sourced for Tellus is grown in clay and calcareous soils. It’s an open-hearted wine, and softly focused with lush layers of black cherries and plums, leather, and earth. On the finish, dried sage emerges, it achieves nice complexity, given its price. Four stars (or ~8.9). ♦ This wine has great value and quality for the price. It is a medium bodied red with tastes for red fruit, spice and grilled herb. The wine has a silky finish and I my absolute top favorite of the 10 [tasted]. ♦ This is a great Merlot from Lazio/ Umbria. The wine shows the grape’s hallmark plumminess and roundedness; also a lot of cocoa and spice and nuts. At about $12, it’s a steal. ♦ If any country could take a grape known in the USA for big-boned, huge-fruited heavy red wines, and create a trademark light- to medium-bodied food wine, it would absolutely be Italy. In the case of the Falesco Tellus Merlot from Umbria, Italy delivered! This wine is not especially light, but it is compared to the American versions, which makes it quite useful as a burger/pizza/pasta weeknight-easy to drink wine. There are typical Merlot flavors of dark fruits and even a little blueberry, but on a lighter frame than many of us are accustomed. Ready to drink now, it is a nice wine at a nice price! 87 Points. ♦ Blackberry and spice aromas are earthy, leathery and stalky. This is youthful and tannic at this point, while oaky flavors of clove and wood spice ride heavily atop blackberry and dark plum fruit. Oak notes and firm tannins… 90 points. ♦ There’s a hefty 14.5% alcohol in this heady Alpha Merlot from Montes, which overflows with Sandalwood and cedar, brambles and rich autumnal berry fruit. Twelve months in new and used French oak will account for some of that spiciness, and 10% of Carmenère in the blend adds some fruity gloss. On the palate the hedonism goes on, with a wash of rich, ripe, intense black fruit flooding the palate, but all the time that cedary, smoky quality is layered beneath. The tannins are noticeable, but ripe and thick, and lead on to a long finish with moderate acidity allowing the wine breadth and a certain plushness. 89 points. • This wine has no Wine Searcher "Tasting Notes" page. ♦ It is less aggressive in structure and power [than Caparone's Cabernet Sauvignon], but is a big wine and not for the faint of heart. It is long on fruit and sports a fat texture, herbal characteristics and a less astringent bite in the finish. Aromatic in the nose, it can be enjoyed now, but it's better to age for removal of any harshness. . . it is also a good buy, not because of any impending softness (a clear taste target of most Merlots) but because it makes a big style statement, the kind rejected by Bordeaux Merlot vintners who look to the grape for quick, soft, supple textures and flavors. Without a doubt, this is strictly a California-styled Merlot and is not another weak attempt to emulate the French. 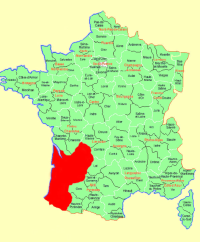 Indeed, Gallic growers are likely to question the validity of this kind of wine making, but would praise it unhesitatingly several years down the road if the wine were tasted blind. ♦ Dave Caparone was pouring the wine. A very honestly brusque person, he merely poured and let his wine speak for themselves. None of his wines are blended. All except the Cabernet Sauvignon (French Camp) and Merlot (Bien Nacido) are estate. All his wines have less than 14% alcohol. All have beautiful acidity and immensely drinkable. All his wines were trusly rustic and had that "Euro-funk" to them that added to their personality. We liked all his wines. ♦ Sourced from Bien Nacido Vineyard. Medium color, this displayed tart black cherry, herbs, and a slightly smoky note. Medium-bodied with bright acidity in the mouth, and finishing with chewy tannins. ♦ Zinfandel, Merlot, and Cabernet Sauvignon. All three . . . wines were $14.00 [now $16], a price point that may cause some of the snobs (but never us hacks) to turn up our nose and expect very little. The snobs would not find what they expect with these wines as they all exhibit very nice fruit and balance. These are food wines, and they are all ready to enjoy with a meal now, but will undoubtedly gain even more balance and structure as they age another year or two. These are all very nice wines, and I think they are worth well more than the price. ♦ [B]ig, smoky, inky and deep, like a Pétrus' backwoods cousin. ♦ Known as a strict purist in his winemaking techniques and for his down-to-earth approach to fine wine, [Dave Caparone] has developed a reputation for his rich, long-lived reds. . . Time has shown that they can age for decades, yet are balanced enough to be approachable when young. ♦ What a pleasure to taste — all big and bold, with great character. . . All Caparone wines are unfined, unfiltered, and made with minimal processing. 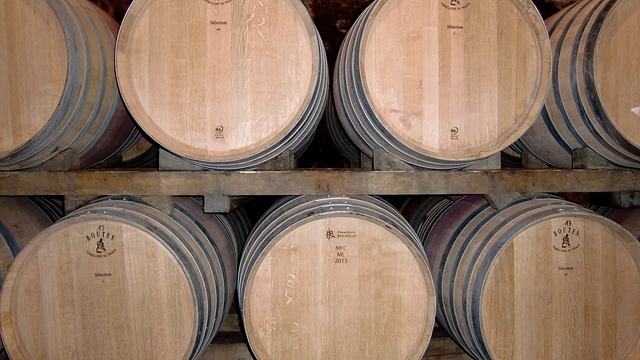 They're aged two years in small oak barrels. And at $16 each, they’re a great value, in my opinion. ♦ [T]this winemaker is one of my all time favorites. From the Santa Maria Valley in California…and I typically like old world wines, but this is made like an old world wine! It's amazing – complex, earthy, and has what Nick calls a house funk, or character, which for some would be considered off-flavors, but that I personally adore. ♦ The unfined and unfiltered, intensely elegant big reds have established a cult-like following over the years. ♦ Italian varietals with a Bien Nacido Cab and Merlot. Insane QPR! Low alcohol wines, and supposedly built to age as well. May be a bit rustic, but I wish there were more wineries like this that just didn't give a damn and make wine without huge overhead and pretense. • This wine's CellarTracker review pages (there appear to be two): 1st & 2nd. ♣This wine demonstrates (again) how much wonderful drinking can be had inexpensively: it is almost universally available at under $10—often quite a bit under. ♦ The barrel program shows an abundance of dark toast, coffee and smoke aromas that meld with black cherry, anise, cedar and chalkboard dust. On the palate, the oak program takes a backseat to flavors of cherry and black currant as vanilla and chocolate fill in behind. Its medium structure creates nice balance as the fruit keeps pushing into the finish. ♦ [It] begins with pleasant aromas of black cherry, plum and blackberry plus a little cola, chocolate and spice. Tasting the medium-bodied wine shows similar flavors to the nose with perhaps a bit more berry fruit. Those cola, chocolate and spice notes continue in the mouth along with vanilla and hints of coffee that lead into the finish of this very, very smooth wine. It ends long, dry and a bit dusty and earthy. This extremely tasty wine was aged in 1/3 new oak for 14 months, which is rather crazy considering [what it sells for]. ♦ The toast, freshly ground coffee, dark chocolate and cherry aromas pop. Plum and chocolate flavors are smooth in feel and linger on the finish. 88 points. ♦ Well-made Merlot tastes of dark cherries and blueberries, with secondary notes of coffee and chocolate. What's not to like? Columbia Crest nails it. This is a dry red wine with luscious fruit and soft tannins, making it an easy drinker for just about every occasion…My wallet wins on this one. ♦ This impressive value wine starts with aromas of baking spices red cherry and blackberry. There are flavors of red cherry blackberry cobbler and anise. Absolutely delicious effort from Columbia Crest. 90 points.